A 2.8-metre great white shark hauled out of the entrance to Wellington Harbour had been feeding on large marine mammals. A team at Te Papa defrosted the shark, caught last year, for measuring this week. 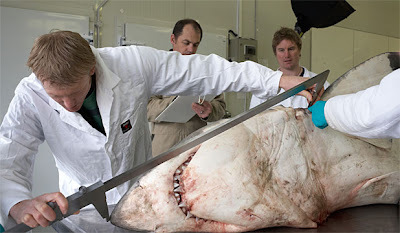 It was the largest great white specimen preserved intact in New Zealand, Te Papa collection manager Andrew Stewart said. One of the biggest surprises, for the examiners, was discovering that the shark had an empty stomach except for a seal claw and some tape worms. The claw was the "smoking gun" that it had started eating seals, he said. "This shark had moved from being a fish eater to being an apex predator ... These are animals that sit right at the top of the food pyramid." Scientists would study markings to establish if the shark had been spotted off Stewart Island, where Conservation Department shark expert Clinton Duffy had collected photographic records of great whites. Cells of the shark would be analysed to try to discover what else it had been eating. The shark was hauled from the water near Barrett Reef in October last year by Peter Amitrano and Alfonso Basile, who had set moki nets. Great whites are a protected species, meaning if they are caught, the Conservation Department has to be notified. What is totally amazing is that we are often unaware of what lies up beyond the breakers of the areas we often use for swimming.The area in which this shark was caught last year contains a quite sizeable seal colony often visited by recreational divers for fun. I'm sure that they had known that an extremely large great white was sharing a similar interest they would not have been so keen. Not so long ago an extremely large Bronze whaler shark was caught off the pier at Petone which extends into Wellington Harbour and was a once very popular swimming spot during the 1950's and 60's. And yet the amount of shark attacks for Wellington Harbour is exceedingly small.